As an avid reader of the FratelloWatches blog you probably know that I write for some other websites and magazines as well. MotoringExposure.com is one of them, every wednesday they publish the ‘Wednesday Watch’-article. Today, the Wednesday Watch is about the Grönefeld GTM-06 Tourbillon Minute Repeater. I have written this article with a bit of pride, since the Grönefeld brothers are Dutch AND are located in the same area as where I am originally from. 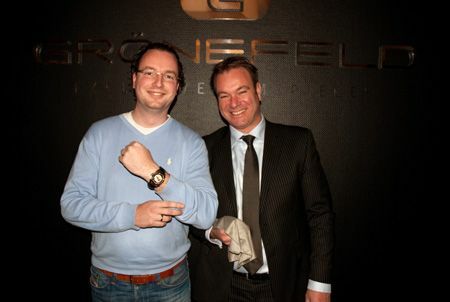 Above you see Bart Grönefeld (right) and myself during the opening of the Grönefeld Exclusive Timepieces Boutique in Oldenzaal. Besides creating their own time pieces, they now have a boutique for other independent watchmakers (McGonigle, Sarpaneva, Kees Engelbarts, Cornelius & Cie) as well. However, to me, the most special time piece of their boutique is their own GMT06 Tourbillon Minute Repeater. As you can see above, I was even allowed to try it on under heavy supervision. The platinum version (limited to 10 pieces only) has a price tag of 385.000 Euro. Below, you’ll see a close-up of the GTM06 in platinum. 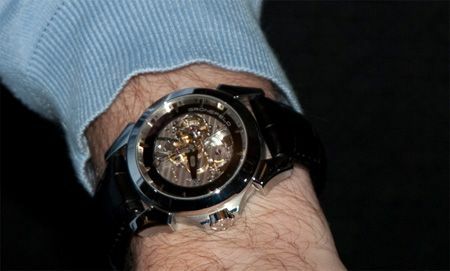 Anyway, for the full article on the Grönefeld GTM06 Tourbillon Minute repeater, click http://www.motoringexposure.com/761/grnefeld-gmt06-wednesday-watch. An article on the opening of their boutique will follow soon.